Sugar Bowl’s Lance McKenney battles to a third-place finish at Auburn Ski Club on Saturday, Dec. 22. Local skier Peter Holmes races to a first-place finish at the Tahoe Mountain Sports Holiday Sprints. Sugar Bowl Academy skier Lexie Madigan celebrates capturing first place at the Tahoe Mountain Sports Holiday Sprints on Saturday, Dec. 22. 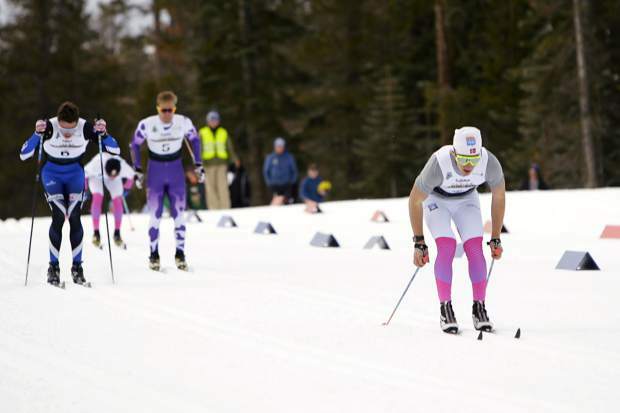 The Nordic race season in the Truckee-Tahoe area got underway last weekend with a pair of annual events at Auburn Ski Club — the Tahoe Mountain Sports Holiday Sprints and Paco’s Freestyle Race. 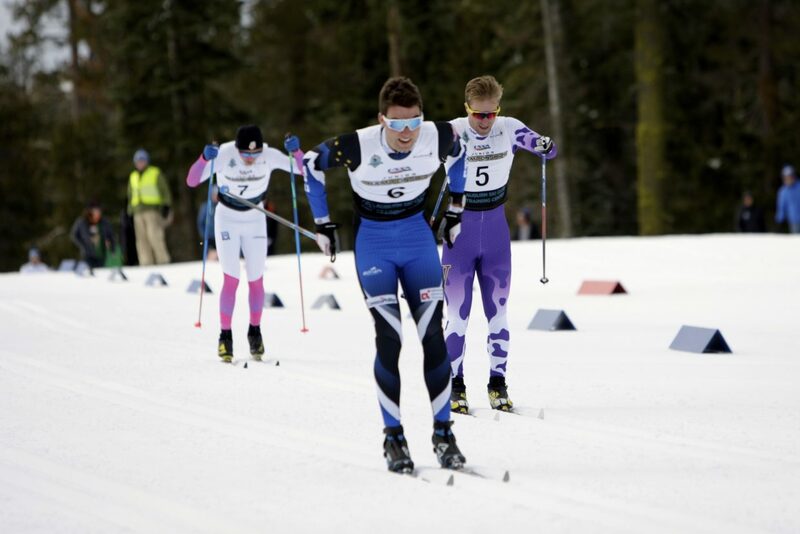 A number of the region’s top collegiate cross-country skiers were on hand for the season openers, returning home for the holidays to race on the trails at Donner Summit. Local skier Peter Holmes, 22, took a break from racing on the North American Cup tour to compete in last Saturday’s Tahoe Mountain Sports Holiday Sprints. 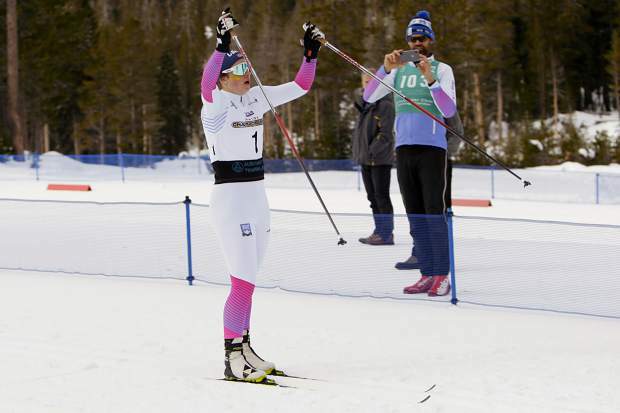 Holmes, who races for Sun Valley Ski Education Foundation, outdueled last year’s winner J.C. Schoonmaker across the 1.3-kilometer course to win the final heat with a time of 2 minutes, 38.1 seconds. Schoonmaker crossed the line in second with a time of 2:39.6. Sugar Bowl Academy’s Lance McKenney finished in third place with a time of 2:43.6. 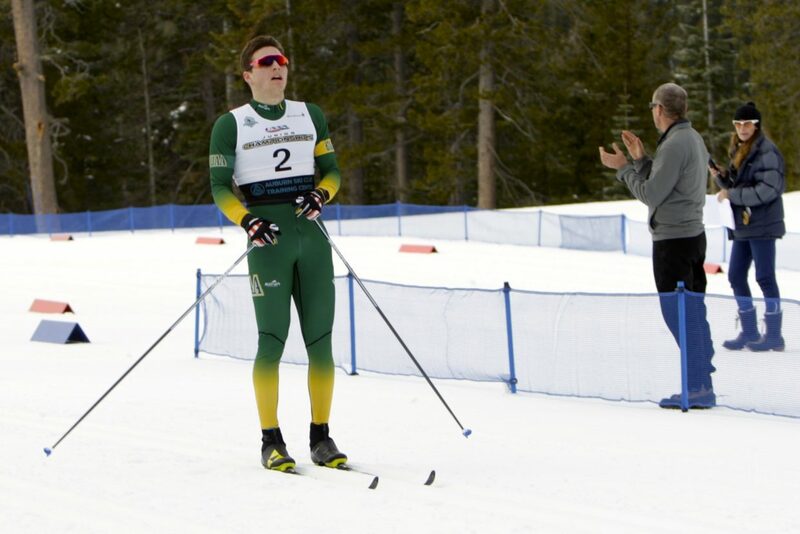 Brandon Herhusky, of University of Alaska Anchorage, was fourth with a time of 2:46.0, followed by Williams College’s Dylan Syben, who finished with a time of 2:53.0. 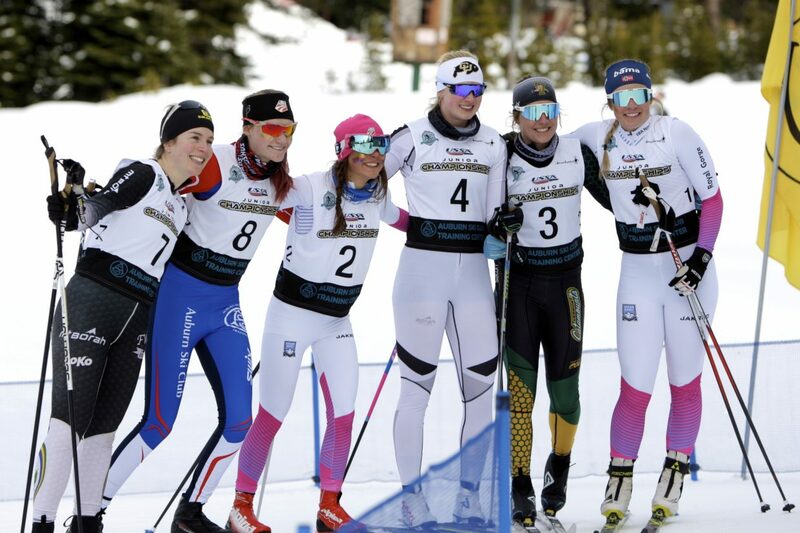 In the women’s sprint race, Sugar Bowl Academy’s Lexie Madigan, 16, led from start to finish, and cruised into the finish area with a healthy lead of nearly five seconds. Madigan finished the race with a time of 3:28.8, claiming first place for the first time in five starts at the holiday sprints. 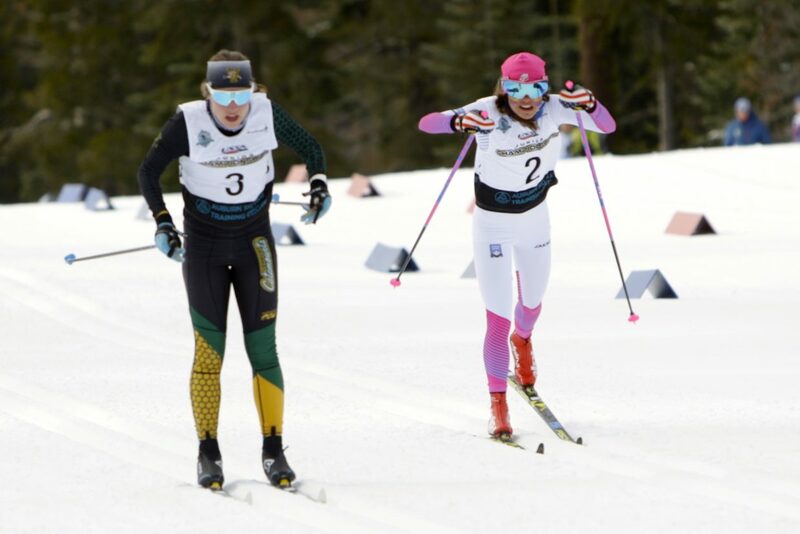 Teammate Sofia Sanchez finished in second place with a time of 3:33.4, followed by University of Vermont skier Lizzie Larkins (3:34.2), Auburn Ski Club’s Quinn Lehmkuhl (3:35.4), and Sugar Bowl Academy’s Kianna Mullings (3:36.6.). 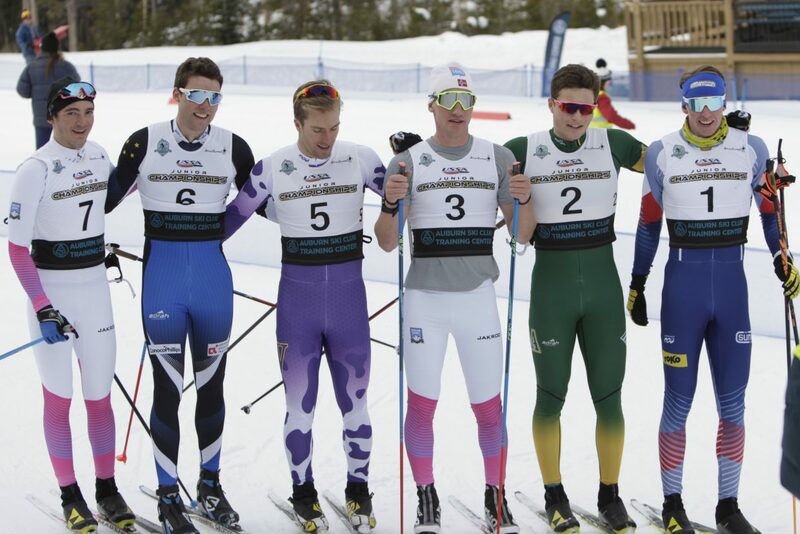 The Tahoe Mountain Sports Holiday Sprints also served as the first Junior National Qualifier. The day’s competition also included youth racing. Auburn Ski Club’s Hannah Hammond took first place in the girls’ U14 division with a time of 3:50.2. Mammoth Lakes skier Cyrus Creasy won the boys’ age group, finishing with a time of 3:22.8. Auburn Ski Club’s Elsa Voegele won the girls’ youth 1-kilometer race with a time of 4:31.5. The club’s Griffin Tuscano won the boys’ 1-kilometer race with a time of 4:39.0. Max Mayfield won the youth stadium race in the U6 division with a time of 5:13.2. The annual Paco’s Freestyle Race was held the following day at Auburn Ski Club, bringing more than 100 racers to compete across 5- and 10-kilometer distances. 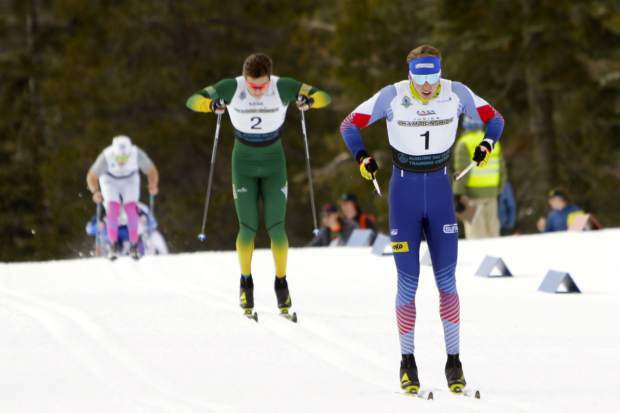 After taking second place in the sprints on Saturday, Schoonmaker, 18, returned to Donner Summit to claim first in the men’s 10-kilometer individual start. 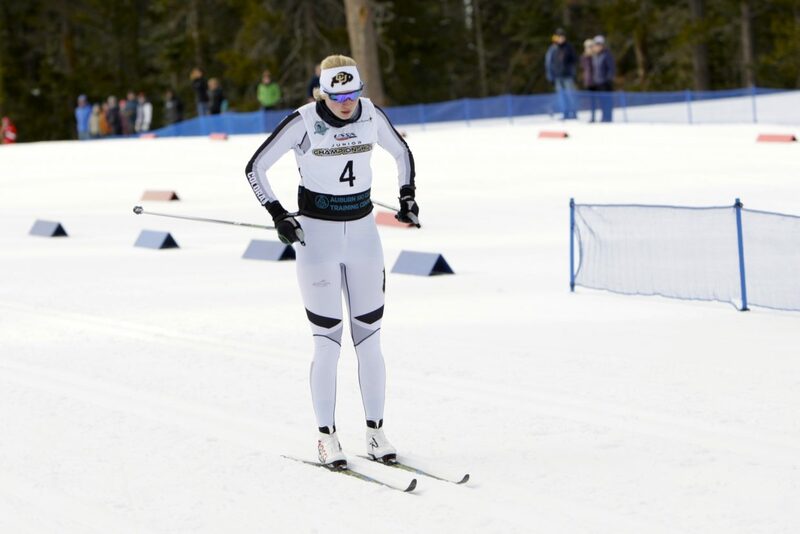 Schoonmaker would defeat the field of 18 other skiers by nearly 10 seconds, finishing the race with a time of 25:36.5. Patrick Johnson claimed second place with a time of 25:46.4, followed by Sugar Bowl’s Nate Cutler with a time of 26:08.1, and Nick Sterling with a time of 27:15.6. Syben also returned for a second day of racing, and took fifth place with a time of 27:19.1. On the women’s side, Sugar Bowl’s Sanchez turned a second place in Saturday’s sprints into a first-place finish in the 5-kilometer individual start event. Sanchez easily won the race, finishing nearly a minute ahead of any other competitor with a time of 13:44.1. Auburn Ski Club’s Lehmkuhl was second with a time of 14:34.5, followed by Madigan with a time of 14:49.8. Auburn Ski Club’s Lily Murnane was fourth with a time of 14:56.9, followed by Kili Lehmkuhl in fifth overall with a time of 15:07.6. In the boys’ 5-kilometer individual start, Cooper Honeywell captured first place with a time of 14:02.2, edging Phoenix Sanchez, who finished in second with a time of 14:03.4. Matt Seline was third with a time of 14:06.5. In mass start racing, Phillip Violet took first place in the men’s 10-kilometer race, finishing with a time of 29:54.7. Ryan Herhusky took first in the 5-kilometer distance with a time of 17:19.5. Lizzie Larkins won the women’s 10-kilometer race with a time of 32:06.2. Sadie Tucker won the 5-kilometer distance with a time of 21:55.0. In youth racing, Katelyn Dalicandro won the 2-kilometer girls’ individual start event, and Pascal Wettermark won the boys’ race. Auburn Ski Club’s Tuscano picked up his second win of the weekend, taking first in the boys’ 2-kilometer mass start race; while Lila Creasy won the girls’ competition. Kenzo Wettermark won Sunday’s youth stadium race.